This royal cuisine is a motley of grainy rice and juicy meat dishes, with a focus on spices. The Nizams believed in savouring their food while relaxing in eating areas called chowkis, where each flavour would be recognised and relished. Nizami cuisine is also infused with a lot of aromas. It uses flower-water in the dishes, especially rose and kewda water, which leaves its fragrance in the food. And finally, for the presentation, the main course dishes are as exotically garnished as the dessert. Varkh (the silver foil coating one uses on desserts) or the gold leaf is placed on most treats and meats on important occasions. Method: Beat the yoghurt in a bowl. Add roasted garlic, black pepper powder, cumin powder, clove powder and whisk gently. 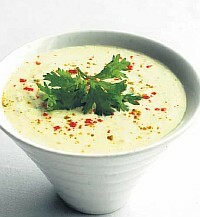 Season the raita with ghee and a pinch of clove powder. Method: Boil the dates, lentil and almond together, strain and ground into coarse paste. Heat ghee in a pan and slowly add the paste, cardamom powder and milk. Add sugar if needed or simply garnish it with crushed pistachio nuts and varkh. Method: Mix salt, saffron, onion paste, ginger paste and papaya paste. Rub the mixture into the meat and keep aside for an hour. Mix all the ground spices and little saffron with half quantity of yoghurt and apply on meat. Take a heavy bottomed pan and place the meat in it. Wash the rice and mix it with the rest of the yoghurt, water and little salt. Cover the meat with rice and seal the lid with dough. Cook it on slow flame for about 30 minutes. When the rice is almost done, sprinkle some milk and ghee over it and serve hot. Method: Mix all the spices and jaggery, and grind them into a fine powder. Roast onion, ginger, garlic and grind this into thick paste. Now heat oil in a pan and temper it with curry leaf. Add onion paste and cook till it turns light brown. Add the spices, powder and chillies. Cook till the gravy gets thick. Serve hot. Method: Soak the desiccated coconut in one cup of water for a few minutes. Later, squeeze the milk from it. Now add salt, pepper, turmeric, coriander, chilli powder, ginger paste, garlic paste and ground melon seeds to the yoghurt and beat well. Heat the oil in a heavy-bottomed vessel and add black pepper corn, lamb marrow and meat and cover. Cook while stirring occasionally for 45 minutes to an hour. In another pan, take some oil and fry onion slices till they turn golden brown. Add these to the yoghurt mixture and mix well. Add cooked meat to this mixture, adjust seasoning and just before serving, add the coconut milk. Adnan Sami performs in Toronto after 8 Years!!! Style Fille: Beyoncé and Destiny’s Child at Super Bowl Halftime Show!